NEVADA COUNTY DEMOCRATIC CENTRAL COMMITTEE STATE OF THE UNION: WHERE IS THE UNION? STATE OF THE UNION: WHERE IS THE UNION? As I await tonight’s State of the Union address, I am reading on CNN’s news page that Trump’s approval rating is above 50% in only 12 states and that some Republican lawmakers are as baffled and appalled by the president’s behavior and mindset as many of their Democratic counterparts. 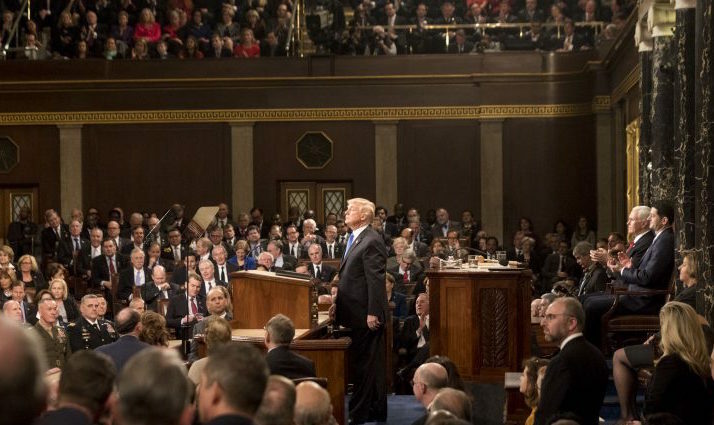 Perusing the NBC news site, I find that Trump, as he prepares – I use that term loosely – to deliver his first State of the Union speech, is pleased that “the State of Donald Trump himself is nothing short of fantastic.” In other words, he is admiring himself in the mirror and patting himself on the back for what he believes to be a successful administration. Whether one views Trump as the anti-Christ or the greatest thing since indoor plumbing, if such disconnect between reality and fantasy is accurate, Americans are in peril. As the NBC site explains, Trump is a “master salesman,” focused on action – any action – that makes him look good and a perpetual “winner.” Everything he does is calculated to allow him to be the last man standing, even if the process does little, if anything, to help the average American. He may think he is the golden child, but many people find him nothing more than a slick and pompous big mouth, belittling those who disagree with him and misconstruing such conduct to be strength and respect. President Trump contends he is doing well. The majority of the American citizenry believes otherwise. Where does that leave the country? As Gertrude Stein allegedly said, “There is no there, there.” If President Trump believes he is providing capable leadership, yet most Americans do not, we are left with a massive void. There is little, if any, trust; momentum to move forward with confidence based on unified support is negligible. Trump can delude himself that he is popular and “in charge,” but unless the majority of Americans feel the same way about him, we are at a standstill with just an abyss where a more unified society used to be.